As a registered Independent voter, I often receive mistargeted political mail. The worst I’ve received recently was an 8×10 color photo of Bush, with a printed message thanking me for supporting the Republican administration. Aside from my annoyance at the mistargeting, I looked at the photo and it exemplifies everything I detest about Bush and his performance at the podium. The printing of this photograph is so cheap, it’s an offense to anyone who ever touched a printing press, I won’t even get started. The persona Bush presents is his downhome Crawford Texas image, with his typical smirk. He’s wearing a canvas coat with the words “George W. Bush President” embroidered on the chest. He’s using the little podium with the little seal on it, Bush likes to use the baby podium because he thinks it looks informal, but it’s obvious he uses it because the big podium with the Great Seal of the President makes him look short, he has to stand on a box. Bush is leaning his elbows on the podium. That’s his most annoying mannerism. 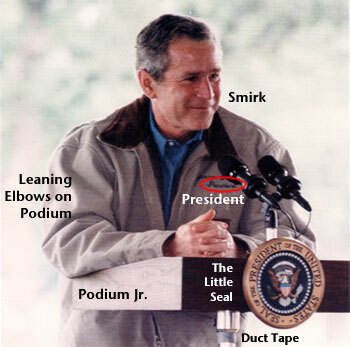 Bush always leans his elbows on the podium when he’s making speeches. First he leans on one side, then the other. He slouches all over the podium like he’s a drunk on a barstool. Didn’t yore momma never tole you to keep yore elbows offa the table? I examined the photo with increasing irritation, then I noticed something that made me burst out into laughter. The little podium has a ring of duct tape holding up the locking ring on the bottom. The President’s podium is being held up with duct tape. I think what is funny is the notion that people in the military really give a crap about what home bound pimple poppers think. FYI: The military is commanded by one civillian: the Commander-in-Chief, who is allegedly a representative of the citizens of the US. He BETTER pay attention to the citizens, or he’ll be another 1-term president, just like his daddy. It has been doctrine since VietNam that the US cannot fight a war that is opposed by a substantial proportion of US Citizens. This is why the US is spending so much time and effort with the UN, i.e. Colin Powell’s speech that was not targeted at convincing other countries, instead it was targeted at convincing americans. There will always be people who carry the weight, and others who sit on their asses reaping the benefit. There will always be lower and middle class taxpayers who slave at substandard jobs, struggling just to pay their taxes, and sending their sons and daughters into combat, just as there will always rich white fratboys getting deferments and avoiding military service. There is a name for protests conducted under the protection of the police, local government and the news media – a relaxing day off. I’ve been looking for an old book I have, it’s called “Resistance” and is a manual for the Swiss Army on how to fight an invasion of Russians. The most interesting part is the section on Soviet doctrine against mass demonstrations. The Sovs channel the demonstrations into “approved” paths, block the alternate routes into and out of the demonstration, and once everyone has arrived at the site, they contain everyone for easy elimination with tanks and machine guns. Except for the firing of weapons, the NYC demo was almost exactly carried out according to Soviet doctrine. I’d suggest spreading land mines on the streets and firing on the crowds with automatic weapons to assist them in gaining a better sense of reality and balance to the debate, you know, level the playing field. I haven’t heard anything as offensive as that statement except from Ann Coulter. [name removed], you are better than that. This country was founded in dissent, and our form of government is intended to form a consensus out of dissenting factions. What ever happened to “I disagree with what you say, but I will defend to the death your right to say it”…?!?!? At a time like this we have a loyalty and an obligation to support Americans that are preparing to risk their lives for the sake of this country. With that in mind, posts with anti-American commentary are not welcome in the newsgroup. Now I ask you, who is more anti-American, someone who advocates machine-gunning peace protesters, or me? The New York Times just published this astonishing article about a large group of Nobel Prize winners who have signed a petition against the war against Iraq. The list of petitioners includes a significant group of Dr. Strangeloves, the very men who built America’s most devastating nuclear weapons. If the President won’t listen to Dr. Strangelove, who will he listen too? Forty-one American Nobel laureates in science and economics issued a declaration yesterday opposing a preventive war against Iraq without wide international support. The statement, four sentences long, argues that an American attack would ultimately hurt the security and standing of the United States, even if it succeeds. A local National Guard unit, the 109th Medical Battalion, has been activated and sent to war. The unit’s website proudly proclaims it provides “eschelon [sic] I and II medical support,” and makes it seem like these guys are pulling dying soldiers from foxholes on the front lines. But as usual with military people, it’s all a big self-aggrandizing lie. The US Military Field Manual clearly states that Area Support Medical Battalions only provide Echelon II support. This means that in the midst of battle, they sit around the well-fortified base waiting for casualties to arrive. While these units take care of critical casualties, the major ongoing duty of any ASMB is minor medical and dental care for the troops. The 109th is largely composed of dentists, since the local Dental College is considered the best in the world. Napoleon said that an army travels on its stomach, but apparently modern armies travel on their toothbrushes. I appreciate the urgent need for medical care for the soldiers, but somehow I doubt any soldier is going to be struck down in the midst of battle by tooth decay. Across the USA, whole battalions of dentists, doctors, and nurses are being uprooted from their local jobs and being sent to Iraq. The local hospitals report losing a substantial number of people to military duty, and some vital medical services are now curtailed, particularly at Veterans Administration hospitals. This is essentially a tax on local communities. As more reserve troops are deployed, cities are discovering their citizens are disappearing, no longer producing goods or services, or spending their income, or generating tax revenue. The irony of this is that the 109th has historically been full of Conscientious Objectors and draft dodgers. During the Vietnam War, many local residents signed up as National Guard reservists with the 109th, in an attempt to avoid the callup. COs were typically assigned to non-battlefield medical units. Even if the 109th had been sent to VietNam (it was not), it was an “HHD,” a Headquarters Detatched unit, it would not go into the field. And certainly you wouldn’t want COs and draft dodgers in frontline units, you’d want them close to HQ where you can keep an eye on these misfits and malcontents. America’s flag has always been freedom’s banner, but lately I feel the Stars and Bars does not represent the America of my ideals, or of the Founding Fathers. That flag is the banner of a government that no longer represents its people. I was particularly struck by a story on CNN.com showing the Abolitionist Flag of 1859. 20 stars represent the States of the Union, with 4 red and white bars removed for the seceding states from the original 13 colonies. This flag represents 20 states standing united against the evils of slavery, in the face of a terrible and heinous war. This banner of freedom from slavery should be the memorial symbol of the Civil War, not the Confederate Flag. I noticed the 20 stars happened to equal the 20 Blue States in the presidential election of 2000, so I was inspired to create a “Blue Flag” representing the majority of voters that are not represented in the current government. It will now be my site’s banner, in the upper right corner of this page. demographic maps from the 2000 election. It is particularly worth noting the Blue States population density concentrated in the northeast US, and the Red States strong in the southern US. It is as if the country is still divided between the industrial North vs the slave-economy South. Did we fight the Civil War for nothing? “You have heard your servant’s prayer–the uttered part of it. I am commissioned of God to put into words the other part of it–that part which the pastor–and also you in your hearts- -fervently prayed silently. And ignorantlyy and unthinkingly? God grant that it was so! You heard these words: ‘Grant us the victory, O Lord our God!’ That is sufficient. the *whole* of the uttered prayer is compact into those pregnant words. Elaborations were not necessary. When you have prayed for victory you have prayed for many unmentioned results which follow victory–must follow it, cannot help but follow it. Upon the listening spirit of God fell also the unspoken part of the prayer. He commandeth me to put it into words. Listen! I demand an immediate end to the US Military occupation of my TV set. They’ve garrisoned my TV set for over 10 years, and it is time for them to go home. Every December, the media is swamped with insipid video clips of military personnel abroad sending greetings to their families in the US. I sincerely doubt their families ever see these clips, they’d have to phone home and tell their families when they will be on TV. That sort of defeats the whole point of these messages. Why don’t they just phone, or write a letter, or send a photo or videotape, instead of wasting the public airwaves? With all the news in this world worth covering, they waste time with this? There is nothing particularly newsworthy about the simple fact that American soldiers are posted overseas during the holidays. Yes, it’s sad to be away from your loved ones at the holidays, but it is hardly newsworthy. They knew this would happen when they enlisted. These clips seem to have appeared during the first Gulf War, I don’t recall ever seeing them before that time. I suppose the media thought they were helping the morale of the troops, but the clips continued after the war was over, and by now, they’ve become just another part of the droning militaristic propaganda machine. It is now January 3rd and the local TV stations are still showing these clips. None of these clips come from soldiers in Afghanistan or the Gulf area, they’re all from soldiers in cushy luxury postings like Japan or England. And most of them aren’t messages to their family, the soldier usually appears on camera with his family, giving greetings to hometown friends. Even worse are the obligatory Thanksgiving and Christmas news stories about the troops eating turkey and cranberries inside a tent in a battle zone. I want to see Thanksgiving stories about soldiers eating MREs in a foxhole because they were too busy in a firefight to make it back to camp for a turkey dinner. And I assure you, there are plenty of those stories, but nobody will ever hear them, they’re too busy pumping out propaganda about happy little soldiers full of turkey. Am I the only person on earth who watched Apocalypse Now, and remembers that Kurtz said the US could never win the Vietnam War, they were too soft because they were used to luxuries like beer and steak barbecues, even in a battle zone? Author CharlesPosted on January 3, 2003 Categories PoliticsLeave a comment on Yankee Go Home! Republicans have stolen control of the Executive Branch, and now they have bullied, lied, and cheated their way into control of the House, the Senate, and the Judicial Branch. There is nothing to stop Republicans from destroying what is left of America. The Democratic Party leadership is solely to blame for this fiasco. Daschle and Gephardt must GO, they must be removed from any leadership role. DNC Chairman Terry McAuliffe should resign and hand the reins of the party to someone who can stand up to Republicans. Due to the lack of effective Democratic opposition, there is nothing to stop Bush from stacking the Judicial Branch, including the Supreme Court, with right-wing judicial activists. With a majority in both branches of Congress, the Republicans will begin systematically dismantling America, and selling it to Big Money special interests. The Rich will get richer, and the Poor will die. This is a sad day for America, it marks the beginning of America’s slide into tyranny, the beginning of America’s destruction. Today, I am ashamed to be an American. Before we go further, please read this primer on paper ballot systems written by one of the foremost authorities on paper and electronic voting systems, Doug Jones, a computer science professor at the University of Iowa. Jones’ series of papers on voting are a revelation. They treat voting like a problem in logic and mathematics, yet are written in plain language that anyone can understand. Jones does an excellent job of explaining an ideal voting system, so I will not belabor those points. Jones also does an excellent job of explaining how the voting system is designed to deter fraud. Let us examine how flaws in these electronic voting systems might be used to commit fraud and overthrow an election. There are many other flaws in these electronic systems that are not immediately evident. Jones’ paper also focuses on counting the votes, another opportunity for fraud. We cannot know how these electronic vote counting systems work, the internal mechanisms are top secret, and not open to public scrutiny. This is derisively referred to in the computer programming world as “security through obscurity.” To prevent fraud, transparency of the system is essential, yet the voting mechanism is absolutely opaque. You have no idea if a rogue programmer has inserted code that discards every 10th vote for a certain candidate. You have no way to verify your vote was recorded, there is no physical record of your vote inside an electronic system. Votes can be manipulated instantly, secretly, and en masse. This essay cannot possibly enumerate all the flaws in these systems, as the specific details of the electronic systems are not public information. This is the most astonishing fact of all. We have handed the voting system over to computer programmers working in secret, one programming error will affect all voting machines. In a paper ballot system, one unscrupulous official may spoil a precinct’s votes, but not the whole system’s votes. This is the biggest fraud of all.